Is it all over for Bitcoin and other cryptocurrencies? Yellen bows to reality… the end of the ED ad… a break in the theft of the giant gold Maple Leaf… and more! “Where’s the volatility?” wonders our macroeconomic maven Jim Rickards. “This summer, investors have been treated to an incredibly low level of volatility,” affirms our income specialist Zach Scheidt. Logical conclusion: “We should expect volatility to return with a vengeance — and prepare for it,” says our small-cap guru Louis Basenese. Indeed, a creepy calm stalks the markets these days. 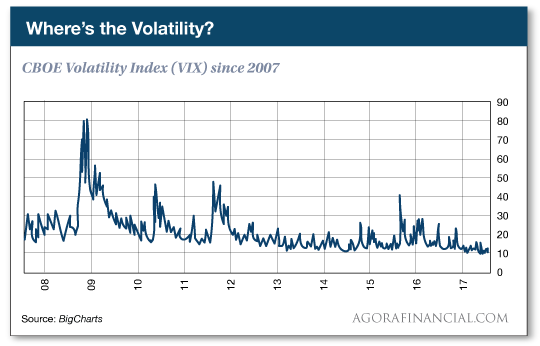 The most common measure of market volatility — or the lack thereof — is the CBOE Volatility Index, the VIX. It’s a real-time gauge of implied volatility based on the trade in S&P 500 index options. “The low level of volatility has lulled many investors into a false sense of security,” Zach goes on. There are risks like inflated stock valuations and the ever-present geopolitical turmoil. It’s not just stocks experiencing this creepy calm, Jim Rickards points out. “Ten-year Treasury note yields have been stuck in a narrow trading range with a yield to maturity between 2.6% and 2.18% since last December. “Oil has traded between $40 and $55 per barrel since last December, with no breakouts either to the $30 or $60 levels that many expected. With one notable exception: foreign exchange. “It seems all of the volatility of important stock, bond and commodity markets has migrated to the biggest market of all — forex,” Jim says. The currency markets hang on every word of central bankers nowadays. Worse, says Jim, “the system has no anchor. “It appears that the investing herd is betting that the placidity continues. “According to Macro Risk Advisors, a firm that arranges volatility trades, anti-volatility bets on the VelocityShares Daily Inverse VIX Short-Term ETN (XIV) are surging. 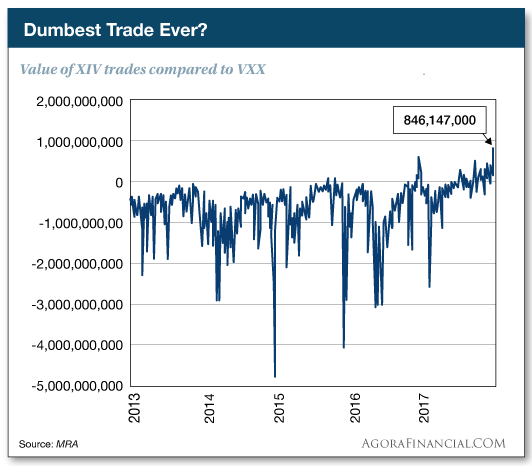 The biggest interest in this trade is coming from retail investors — people with zero experience trading the ebbs and flows of volatility. What to do instead? Louis says the smartest trade in the market right now involves a rare class of stocks — we’re talking a mere 0.05% of all the names that trade each day. They have an uncanny habit of doubling, or zooming up even five- or 10-fold… in a single day. Best of all, to tap into these enormous gains you don’t have to play forex or options or anything exotic. And the next big opportunity might be only 13 days away. Louis explains all when you follow this link. Wouldn’t you know it? The soothing words of Federal Reserve chair Janet Yellen have sent the VIX to its lowest level in two weeks. Finally, an acknowledgment of the reality Jim Rickards has been harping about here for weeks! Gold is creeping higher, the bid now $1,221. The dollar has strengthened a bit against the euro to $1.142, but weakened against the Japanese yen; it takes 113.2 yen to equal one dollar. Crude prices are firming a bit after the Energy Department’s weekly inventory report, a barrel of West Texas Intermediate fetching $45.28. Does this qualify as “pump and dump”? The IPO price was $17. Morgan’s previous price target was $28. Now it’s $16. SNAP trades as we write for $15.31. Supposedly Morgan Stanley has had a change of heart about Snapchat’s ability to compete with Facebook’s Instagram app. Which is amusing because back in May our Greg Guenthner explained how Facebook CEO Mark Zuckerberg tried to buy Snap in 2013 and was rebuffed. He immediately set about replicating Snapchat’s features and has succeeded swimmingly. The mainstream is hitting out at cryptocurrencies like Bitcoin again. We have no idea who’s right… and fortunately you don’t have to know who’s right to make a fortune off the cryptocurrency market. As long as you’re willing to try something new and you’re willing to part with $20, you can position yourself for a massive windfall starting in less than three weeks. The other big brand — the one with the goofy bathtub imagery — will lose its patent protection halfway through the NFL season, and its maker, Eli Lilly, has been in no rush to snap up NFL ad inventory. It’s not just the money the NFL and the TV networks will miss — it’s the viewer engagement. According to iSpot.tv, the typical commercial for the leading brand is watched 75% of the way through. Really? Those lame commercials the last couple of years featuring a woman in a jersey talking to the camera? Far better were the ones with the aspirational blue-tinted world in which no woman ever appeared: Even if you didn’t need an ED drug yourself, you sorta wished you did — just so you could be like that guy who used the horses in his trailer to pull his pickup truck out of the mud. By God, that was inspired brand advertising! Early the morning of March 27, thieves broke into the Bode Museum in Berlin and snagged a “Big Maple Leaf” issued by the Royal Canadian Mint in 2007. It’s nearly 21 inches in diameter and weighs 221 pounds. At current gold prices it’s worth north of $4 million. Early today, police raided 13 buildings around Berlin and arrested four people — all related to each other, all between ages 18–20. They’re acquainted, we’re told, with a guard at the museum. P.S. We love hearing from happy readers: “Ray, I’m On My Way To Becoming a Marijuana Millionaire!” says a satisfied reader of Penny Pot Profits. Ah, yes, that was Ray Blanco’s recommendation last Thursday. He urged readers to sell yesterday if they hadn’t already. More is coming. If you don’t want to miss out on the next lucrative penny pot stock trade, here’s where you need to go.